Fresh figs everyday. A Mediterranean dream or reality in the south of Sweden? The latter. I know people think we have polar bears walking the streets (not true!) but Sweden in the summer is often warmer (and less humid) than the UK, at least in the south where I’m from. And in my parents’ garden we have peach trees and fig trees bearing fruit each year. The two weeks I was in Sweden earlier this month we had fresh figs every day. So many in face we had to come up with various ideas of how to eat them. This starter was one of the winners and it’s a simple assembly job with no actual cooking required. Perfect for a summer lunch or to start off a more casual dinner party. (Yes, it goes perfectly with rosé.). Take the burrata out o the fridge a good hour before you need it so it’s not fridge cold. Take a serving plate and cover the base with rocket leaves. Place the burrata whole in the middle of the plate and arrange the ham sliced and fig quarters around it. Drizzle with olive oil and balsamic vinegar. Season well. This favourite salad of mine doesn’t really require a recipe, but I wrote it down anyway, mainly as a reminder to myself. It’s the combination of some green leaves, fresh juicy tomatoes, salty ham and creamy burrata that makes it work, but you can add anything you like to this. I think it would be nice to add some olives and/or sunblush tomatoes, maybe some artichoke hearts, but it’s nice as it is. Hope you enjoy it as much as I do! Divide the rocket and cherry tomatoes on two plates. Place a few slices of ham in the middle of each plate. Cut the burrata in two and place half on each plate on top of the ham. Drizzle with olive oil and balsamic vinegar all over, paying extra attention to the burrata. To finish, season and drizzle with crema di balsamico. Serve with some nice bread. 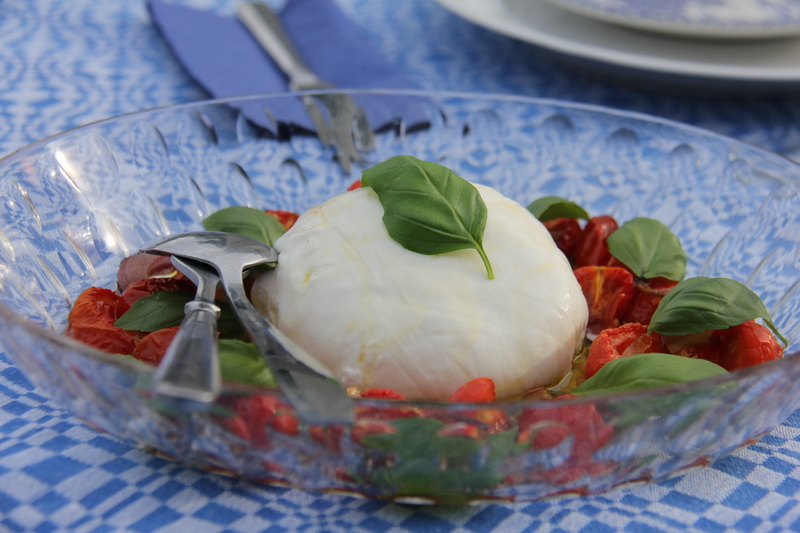 I love burrata, the creamier cousin of mozzarella, a lot but I struggle to find it in Sweden. I’m sure they have it in some of Malmö’s better cheese shops but I thought it easier to bring a fresh one with me from my local Whole Foods. We had it as a starter one evening soon after arrived to Sweden, together with slow roasted tomatoes, a nice olive oil, grilled bread and a bowl of buttery nocellara olives. 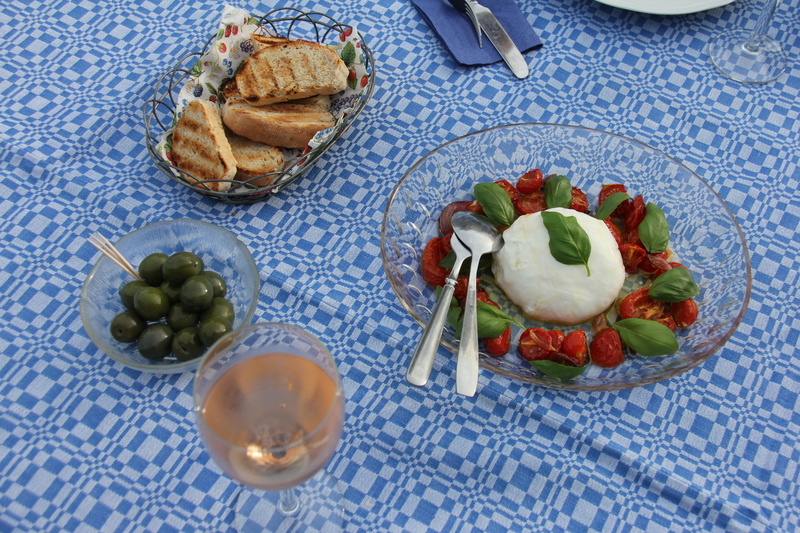 It almost felt like we were by the Mediterranean; being sat outside, next to a fig tree, sipping rosé and eating the creamy burrata with slow roasted tomatoes. Such a lovely evening. Pre-heat the oven to 125C. Place tomatoes, onion, garlic, and basil in an oven-proof tray. Add olive oil, salt and pepper and stir so the oil coats everything evenly. Place in the oven and leave for 2-3 hours. Remove the (now brown) basil from the tray. Plate the rest, garnish with fresh basil leaves and a good splash or olive oil.